The one and only Michael Monroe (Hanoi Rocks) takes some time to chew the fat with Ragman in a thrilling interview that includes work on his latest album, Blackout States, as well as his amazing experience of neary 40 years in the industry. And make sure to check out [and buy, if you like] his new album available from Spinefarm Records, because that's how we get more music, capische? HORNS UP! Michael Monroe - "Old King's Road"
(New York, NY): Michael Monroe will release Blackout States on October 9 via Spinefarm Records. The iconic artist has shared the album artwork and track listing ahead of the release. 1. "This Ain't No Love Song"
3. "Goin' Down With the Ship"
4. "Keep Your Eye On You"
6. "Good Old Bad Days"
9. "Under the Northern Lights"
11. "Dead Hearts on Denmark Street"
12. "Six Feet in the Ground"
The record was produced by Chips Kiesbye (TheHellacopters, Nomads) in Gothenburg, Sweden, and mixed by Petri Majuri inHelsinki, Finland. Select few are the ones born to rock and fewer survive to be called seasoned rock warriors. 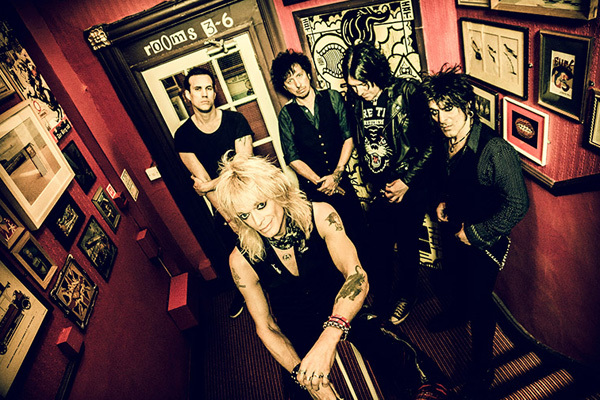 The Michael Monroe band features nothing but the latter, consisting of bassist Sami Yaffa (Hanoi Rocks, New York Dolls), guitarists Steve Conte (New York Dolls, Willy DeVille), and Rich Jones (The Black Halos, Amen) and drummer Karl "Rockfist" Rosqvist (the Chelsea Smiles, Danzig). On the new album, the legendary vocalist said, "I am extremely excited about our new album, Blackout States. It has all the ingredients of a perfect rock 'n' roll record - strong melodic songs with great meaningful lyrics that defy all clichés, delivered with a punky, ballsy attitude by a killer band. I highly recommend Blackout States to anyone who's even a little bit interested in what real, authentic, high energy rock 'n' roll at its best sounds like today." MICHAEL MONROE - hugely influential fronntman, force of nature, multi-instrumentalist and revered rock 'n' roll icon—will release a new studio album, Blackout States, on Friday, October 16 via Spinefarm Records. This 13-track outing was produced by Chips Kiesbye (Hellacopters, Nomads) in Gothenburg, Sweden, and mixed by Petri Majuri in Helsinki, Finland. It is the follow-up to Horns and Halos, a Finnish chart-topper in 2013. With Blackout States, Monroe's current touring and recording outfit, comprised of bassist Sami Yaffa (ex-Hanoi Rocks/New York Dolls), guitarist Steve Conte (ex-New York Dolls/Company of Wolves), guitarist Rich Jones (ex-Black Halos/Amen), and drummer Karl Rockfist (ex-Chelsea Smiles/Danzig), provided strong creative support for a groundbreaking artist whose reputation continues to flourish. Many of rock's most noted performers, including Dave Grohl and Slash, have cited Monroe's unwavering drive and three-decade-plus career as a genuine source of inspiration. Indeed, when Slash headlines the Ice Hall in Helsinki on May 28, Monroe will be the invited "Special Guest," opening the show in front of thousands of fans; after that, he heads across to London to play the Camden Rocks Festival on May 30. This one-off UK appearance at Camden Proud will be filmed by celebrated videographer/photographer Ville Juurikkala as part of the video for the first single from Blackout States. As with Horns and Halos, the new recordings see Monroe both toasting the future and honoring the past, occasionally giving the nod to glam punk pioneers, Hanoi Rocks, the group with which he forged his name in the early-to mid-'80s. Says Monroe, "I'm extremely excited about our new album, Blackout States. It has all the ingredients of a perfect rock 'n' roll record: strong melodic songs with great meaningful lyrics that defy all clichés, delivered with a punky, ballsy attitude by a killer band. I highly recommend Blackout States to anyone who's even a little bit interested in what real, authentic, high energy rock 'n' roll at its best sounds like today."